I am definitely one of those people that can say my tastes have changed as I have aged. Here is a perfect example. The summer has arrived and it is time to take out my Nantucket Basket Purse. I was given this Nantucket Lightship Basket Purse as a birthday gift by two special people. I never imagined this would be on my need to own list, but as time passed the "desire and need to own" and an appreciation came. My Nantucket Lightship Basket Purse has a carved dolphin in bone on the top, as are the handle domes and the front latch peg. The bottom inside of the basket has a 2011 penny embedded in the base and my name is on the inside of the lid. I just love it! A perfect summer accessory. Like many handmade items it becomes even more beautiful as it ages. Imagine a handful of sailors in the mid-1800’s on a stationary ship off the New England coast. Their sole responsibility was to warn other ships of the dangerous shoals nearby, by raising and maintaining a large lantern. To pass the long hours on board after their duties, some of the sailors aboard these “lightships” would make baskets as gifts or for sale back on Nantucket Island . The sailors would use wooden molds, sometimes cut from old ship masts, to maintain the basket’s shape. They would attach a wooden base to the mold and then taper and fit vertical staves to the base. Once properly spaced, the actual weaving could begin. Both the vertical staves and the horizontal “weavers” were made of rattan or reed, brought back by Pacific sailing ships. When the basket was completed, the sailor would inscribe his name on the bottom of the base. The Nantucket “lightship” basket era lasted from 1854 until 1905, when stationary lighthouses began to replace the ships. The baskets made after that time are referred to simply as “ Nantucket baskets”. 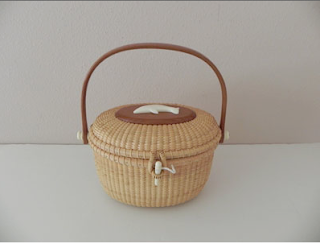 Nantucket baskets, known for their sturdiness and beauty, are today, highly collectible. The “lightship” baskets are often valued in the thousands of dollars. Today, popular demand for quality-made pieces and the rising cost of materials have resulted in higher prices. Ladies’ handbags in the Nantucket lightship style were first introduced in the middle of the 20th century, and are extremely popular today. They are easily identified by a woven or wooden, loosely fitting top, adorned with a piece of scrimshaw, ivory, bone, or polymer. While different craftsmen have their own style, materials and shape, those basic tenets of the Nantucket basket remain the same. Although lightships have been replaced with more modern ways of protecting our shores, the craft that began on them still flourishes today .